[3rd APWS] Breaking News: Yangon Declaration adopted !! 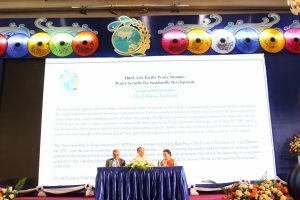 The Yangon Declaration was adopted today at the Closing Plenary of the 3rd Asia-Pacific Water Summit (APWS). The 3rd APWS was held by the Republic of the Union of Myanmar and the Asia-Pacific Water Forum (APWF) under the overarching theme “Water Security for Sustainable Development”. The script of the Yangon Declaration is here (PDF). The highlights of the Summit will be available soon on the official website. The APWF will bring this achievement and further progress to the 8th World Water Forum that will be held in Brazil, March 18-23, 2018.